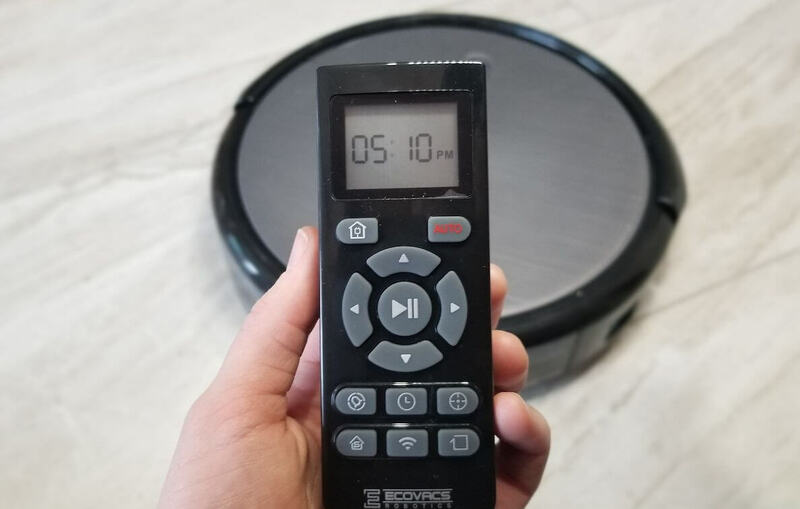 If you’re looking for the current best selling robotic vacuum on Amazon, it’s not a Roomba or Samsung– it’s the affordable Deebot N79 by Ecovacs. Since we had never heard of Deebot, we wanted to try it out for ourselves with an in-depth Deebot N79 review. Read on to find out if this inexpensive vacuum has enough features to keep your floors clean. 1.6 Is Deebot N79 Worth it? As you can see in our video review, the Deebot surpassed our expectations. It has a considerably lower price tag than its competition, and there are usually coupons or sales to bring the price down further. Considering its low price, we found that Deebot was a pretty great vacuum, with a few drawbacks as noted below. The vacuum seems like a standard size for robotic vacuums: it’s 13″ across and 3.1″ tall. Its auto button on the top manually triggers the automatic mode. It also has a WiFi status light to indicate when it’s connected the internet. It has several sensors, including one on the front to stop it from bumping into things, and one on the bottom to prevent drops. Just in case the sensors don’t see a nearby wall, the N79 has built-in bumpers so it isn’t slamming into anything. In our testing for this Deebot N79 review, Deebot N79 never crashed hard into any walls or furniture. When Edge mode was activated, it used its sensors to clean close to the edge, and the bumpers provided a safety barrier. 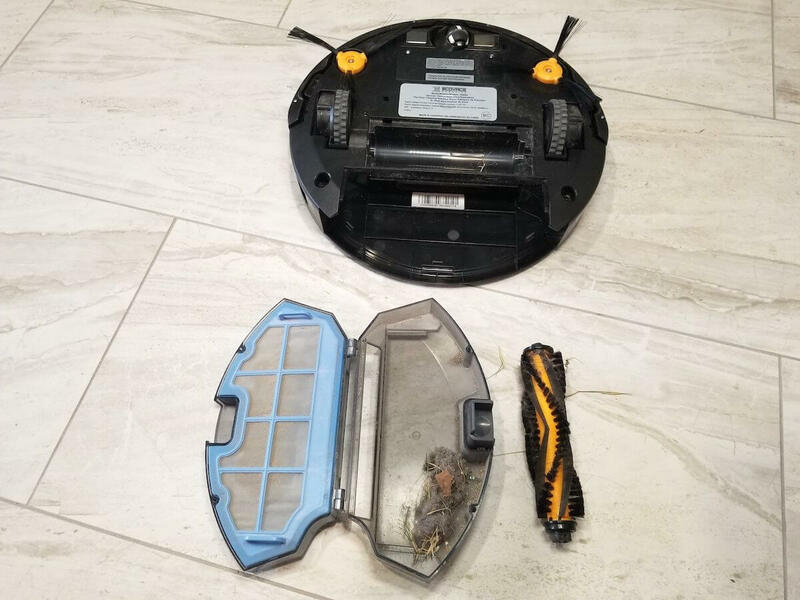 When the sensors became dirty and could not function, the vacuum beeped and sent a mobile alert with information about which sensor to clean. The Deebot N79 navigated a few very tight spots without any issues, including under our kitchen table. It did get stuck a few times during testing: once on the base of our Christmas tree, and another time at the base of our couch. When it gets stuck, the vacuum beeps loudly until you come rescue it. This would be more annoying if it got stuck frequently, but it was really rare. Overall, N79 transitioned well between tile and our thick shag rug, which we were expecting to be difficult. Ecovacs doesn’t recommend this vacuum for thick carpet or rugs, but if you’re using it in an area with mainly tile or wood, it will work very well. A cleaning tool. We loved this little cleaning gadget! It’s got a hook with a small razor, plus a brush on one end and a claw on the other. Remote control with batteries. This functions just like the manual controls in your app and takes two AAA batteries (included). 2 sponge filters and 2 high efficiency filters. 1 sponge and 1 high efficiency filter are installed in the Deebot when it arrives, and there are also one replacement of each filter included. 4 side brushes. Snap on 2 of the brushes during set up and save the other 2 as replacements. These little sweepers make it easy for Deebot to pick up the excess dirt near your baseboards. Power docking station with power adapter. Keep this plugged in on the floor so the Deebot can dock itself when it needs recharging. Some vacuums are a nightmare to clean, but not the Deebot. You can easily snap off the roller brush and use the included tool to clean it. You can also slide out the dustbin to empty it or clean the attached filters. Every time we emptied out the N79, we were surprised and a little disgusted how much dirt it collected. The app is simple. It’s nothing fancy to look at, but it gets the job done without any complications. For the first time you connect your Deebot to WiFi, you’ll want to select N79 from the list of options. Choose your WiFi network and type in the password. Then you’ll hold down button on remote for 3 seconds to connect D79 to your WiFi. We had no issues connecting for our Deebot N79 review. The app works on iOS and Android and includes the manual controls needed for those who want to go joy riding with their N79. You can also easily change modes using the icons on the bottom of the home screen. There is an option for scheduling cleaning at specific times and days. I didn’t use this feature heavily since the floors have to be clear of items for the vacuum to run without getting trapped or sucking up something you don’t want it to. The app also sends alerts when you need to change out accessories like filters. For now, Deebot N79 isn’t compatible with Alexa and Google Assistant. That’s a bummer since it’s WiFi connected and some of its competitors offer this feature. Maybe this integration will come through a software update later, or an upgraded version of this vacuum. Another big drawback is that this Deebot only functions on 2.4 GhZ, not 5GhZ. So if your phone is connected to a 5GhZ network at home, it cannot control the N79 unless you switch to a 2.4 GhZ network. 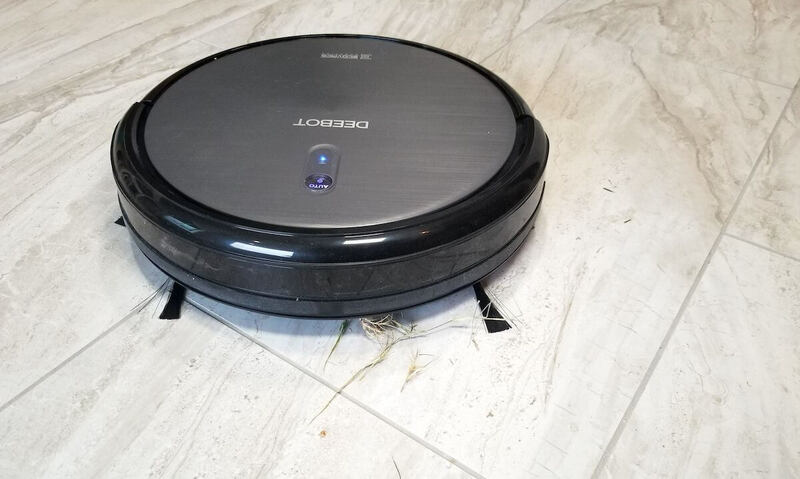 Deebot cleans thoroughly, rarely leaving behind a crumb. When we tested it for our Deebot N79 review by dropping a pile of pistachio shells, the Deebot sucked them all up, no problem. On a more grainy substance like cinnamon, the robot picked up most of the spill, but not quite all. After its second or third pass, all spills were thoroughly cleaned. While it’s cleaning, the Deebot is reasonably quiet compared to traditional vacuums, operating at around 64 decibels. I didn’t run it while I was watching TV, but that’s because I prefer to watch Black Mirror with an eerie background silence. There are 5 modes within the app that make Deebot easy to use in different situations. Auto: This is the basic mode that allows Deebot to wander around your home, cleaning up dirt and debris. Spot: After your toddler has craft time, use the manual controls on the app or remote to drive Deebot to the area that needs cleaning. Then turn on Spot Cleaning mode and let the Deebot do its thing. Edge: N79’s Edge mode is a sight to behold. It works right along side your baseboards to clean the hard-to-reach areas of your floor, and it cleans those areas impressively well. Its sensor and bumper prevents it from damaging your walls. Single Room: After you turn on Single Room Mode, Deebot N79 will sense if it’s wandering out of the room. When we tried this mode, we were surprised to watch the vacuum turn around when it realized it was heading towards a hallway. Charging: Once your floors are clean, send N79 back to its docking station by turning on charging mode. Deebot N79 comes with a built-in lithium battery that lasts “up to 100 minutes” according to their reports. You can easily monitor the battery life in the app. In our testing, the battery was impressive and cleaned most of our home before dropping below 50%. Granted, we have an average 2,200 square foot house. Once the battery runs low, N79 automatically goes into Charging mode and returns to its charging station. You also have the option of manually turning on Charging mode whenever it’s done cleaning. For the most part, the vacuum found its way to the charging dock well, although there was one time it definitely took a long detour before finding its way home. When the battery is fully drained, it will take about 4 hours to completely recharge. Additional batteries are available for purchase from Ecovacs, although we haven’t needed one so far. Is Deebot N79 Worth it? 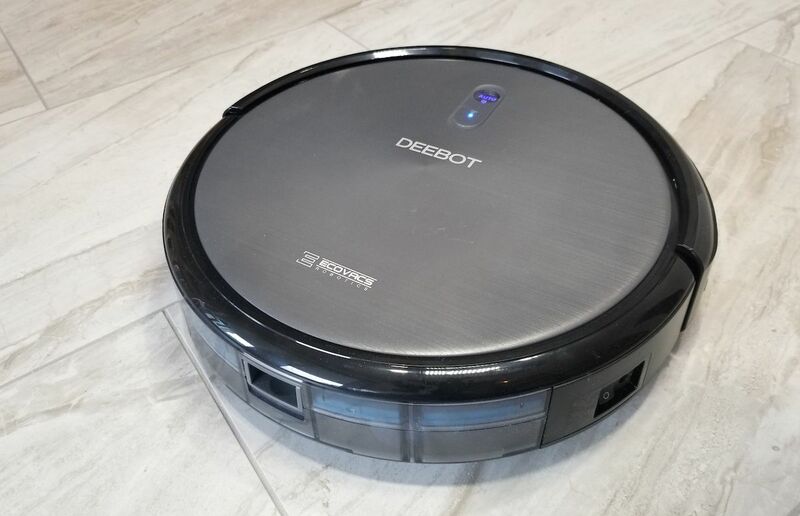 In our Deebot N79 review, we found that the vacuum is worth it thanks to its low price tag and impressive range of features. The vacuum worked well for us and kept our floors tidy. While it’s a lesser-known brand that is missing features like Alexa/Google Assistant integration and room mapping functionality, it has all of the features for convenient and clean floors. I love the Single Room mode to keep Deebot from wandering too much. I’ve also used all of the other modes in the app. 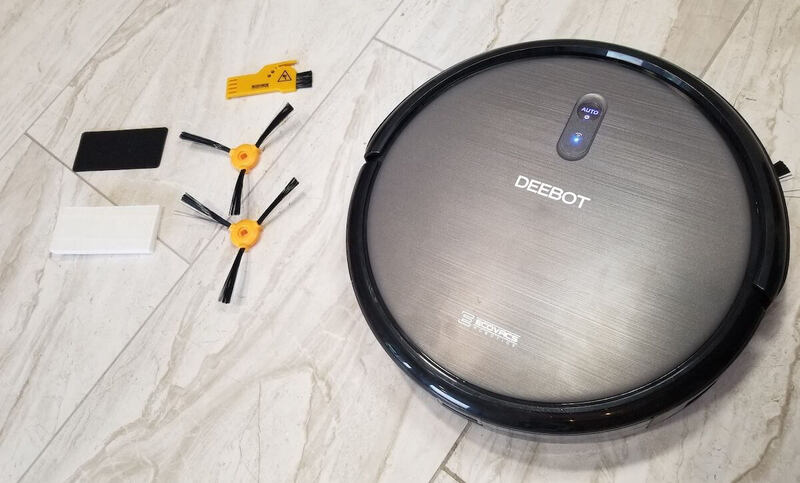 Deebot picks up a surprising amount of dust, dirt, and hair while requiring very little effort on our part. This improves the overall cleanliness of our home and removes pet hair and allergens from the air. For all of these reasons, I can confidently agree with all of the strong Amazon reviews and say Deebot N79 is worth it. If you have any questions about Deebot N79, leave them in the comments below!